After I made the steampunk Raspberry Pi Laptop (this one) several people commented that it is “nice”. But while many liked the case, the computer hardware was not something they would be interested in. A better idea would would be to make cases that to carry a modern laptop. 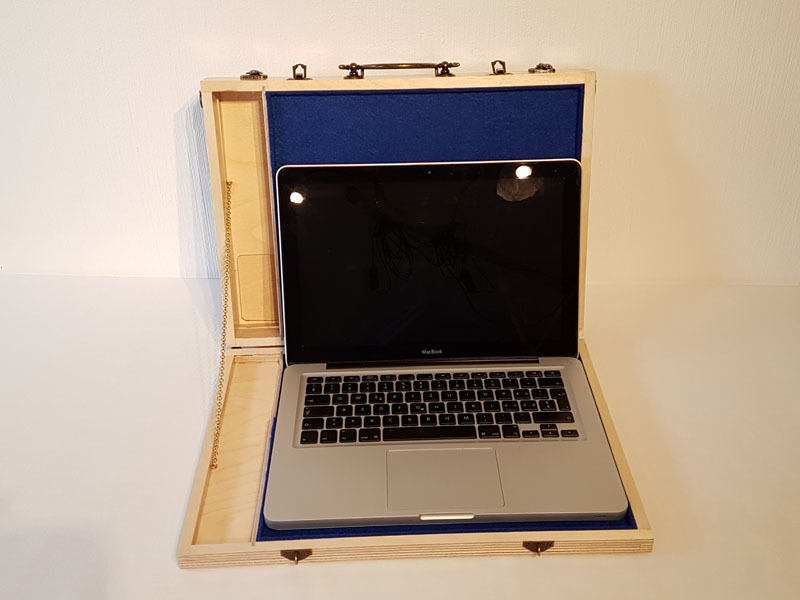 The final result is wooden laptop cases that will fit a 13″ Macbook Pro (the version with retina display – see full specifications here). Click on each of the images to learn more the specific laptop case. They are currently for sale (here) and the back is mostly open where a custom name can be placed as exemplified in the following image. They are therefore only partly finished and will get their final coats of lacquer after this has been done. There is one laptop case that is not finished yet. I have a blue felt interior and silver fittings. Any suggestions on what image to place on the cover would be nice. The Celtic Knot Dragon is quite popular. On this case the dragon is on the front cover and the Triquetra on the back. It has a blue felt interior where the laptop is stored (buy it here). I combined the images of a woman reading and a flower with a humming bird sprouting from the book as the front cover of this case. The back cover has 4 disks with flowers as the feet when the case is open. It has a red felt interior where the laptop is stored (buy it here). NOTE – the cases are made from plywood that warp with humidity. The bottom of the case is slightly warped and this can be seen when the it is placed on a flat surface (see video). The extend that it warps depends on the humidity and other factors. Over time the warping may reduce as the sheets of wood align with each other. I combined the images small child reaching and a T-Rex bending down as the cover for this laptop. It is a bit of a dramatic scene and open for interpretation. The back cover has 4 T-Rex prints that serve as feet when the case is open. It has a red felt interior where the laptop is stored (buy it here). The laptop case is made from Baltic Birch plywood. It has a compartment for a 13″ MacBook Pro retina display laptop. It has a side compartment for the cable and charger. The back compartment is large enough to fit standard size papers and books (A4 and letter). One side of the laptop compartment has a space where the charger, earphones and other cables can be plugged in while the laptop is used within the case. The case ships with a shoulder strap that attach to the sides of the case. This strap can be replaced easily with any other type of shoulder strap. There is a chain that will stop the case to be opened completely. This in combination with the small feet at the bottom will allow the laptop to be used without taking it from the case (example). The felt interior provides a soft compartment to protect the laptop. The back cover has space for a custom name. They are thus not completely lacquered on this side. Note – the laptop cases are made from wood and is NOT WATER PROOF. It is covered with several coats of polyurethane lacquer and is therefore splash proof. If it gets wet it is recommended that you wipe dry it with a cloth as soon as possible. It will also keep the laptop dry from minor splashes but water my get into the paper compartment. It should not be used in the rain. Note – the cases are made from plywood that warps with humidity and other factors. The warping may reduce over time. Note – it is easier to store the cables after the laptop compartment has been closed. It is also better to remove the cables before the laptop compartment is opened (makes for a neater opening and easier to get the charger). Note – the case can carry up to 5 kg including the laptop. More weigh may place unnecessary strain on the wooden components and attachments. A full blog will follow on how I made the laptop cases. There will also be additional images on the case that has been sold and reasoning for the design choices and laptop sizes. Subscribe to this blog or follow me on YouTube to get the post and video as it is released.